LAHORE: (Monday, November 12, 2018): Punjab University Vice Chancellor Prof Niaz Ahmad Akhtar has said that the PU administration would promote research which would help resolve problems being faced by the society and country. 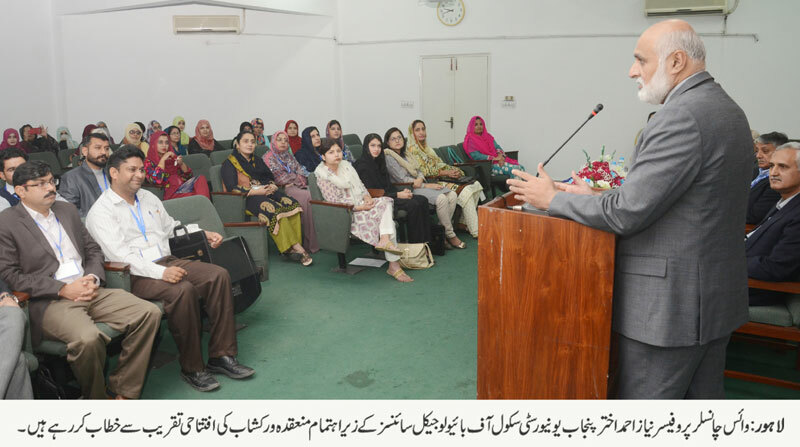 He was addressing the opening ceremony of workshop on production and purification of recombinant proteins organized by School of Biological Sciences here on Monday. SBS Acting Director General Dr Naeem Rashid, scientists, faculty members and students were present on the occasion. Addressing the ceremony, Prof Niaz Ahmad said that it was the time to work for the welfare of society and the country and PU administration was determined to take lead role in this regard. He said that PU was also strengthening industry-academia linkages for commercialization of research projects for the benefit of society.